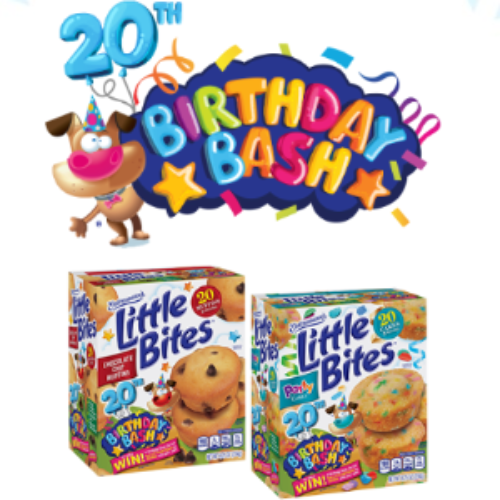 You can enter the 20th Birthday Bash Sweepstakes from Little Bites for your chance to win a VISA $500 gift card for your own birthday bash plus a year supply of Little Bites muffins awarded in the form of fifty-two coupons. In addition to that, Entenmann’s will donate $500 to the children’s charity of your choice. The ARV of the grand prize is $1,260. Entry ends March 29, 2019. Whoot Whoot! All aboard the Little Bites birthday train! Are you as excited as I am about this giveaway from Little Bites? I know I probably shouldn’t, but it’s a guilty pleasure of mine to indulge in a bag of brownie Little Bites a couple times a week. My “rain on your parade” husband always gripes about how big the bags are for five tiny muffins, but I pay him no mind. Can you imagine, a whole year supply? The real trick will be not eating them all in a week! What would you spend a $500 VISA on? Not to mention if you’re the winner they give you a $500 VISA gift card. In my opinion the next best thing to cash is a VISA gift card since you can spend it practically anywhere. Let’s think of all the wonderful things you could buy with $500- a small TV, gaming console, high-end vacuum, computer, tablet, smart watch, dishware, cookware, a knife set, a fishing pole, I mean it’s just an endless list. Of course, you may just want to use it to pay some bills, buy some groceries, or use it for gas. The great part is, it’s up to you! But let’s not ignore the fact that in addition to a gift card and year supply of tasty goodness for yourself, Entenmann’s also donates $500 to a charity of your choice. The first one that comes to mind for me is St. Judes. It just breaks my heart to think of all the children fighting cancer. But there are so many great causes for children. You could have them give it to an Autism foundation, an abuse prevention outfit, Toys for Tots, and so many more. As you age you get more aches and pains, you weather financial crises, you love and you lose, but one thing is for sure, no child should have to face those problems at such a tender age. I really appreciate that Little Bites is willing to not only make a small donation, but more importantly draw attention to the needs of children. As always I am wishing you, my wonderful fans and subscribers, the best of luck to be the winner of this sweet tasting sweepstakes. Let me know in the comments below what you would spend the $500 VISA gift card on and, how long you think a year supply of Little Bites will last in your house. Thank you so much for these great giveaway`s!! Lets WIN !! !